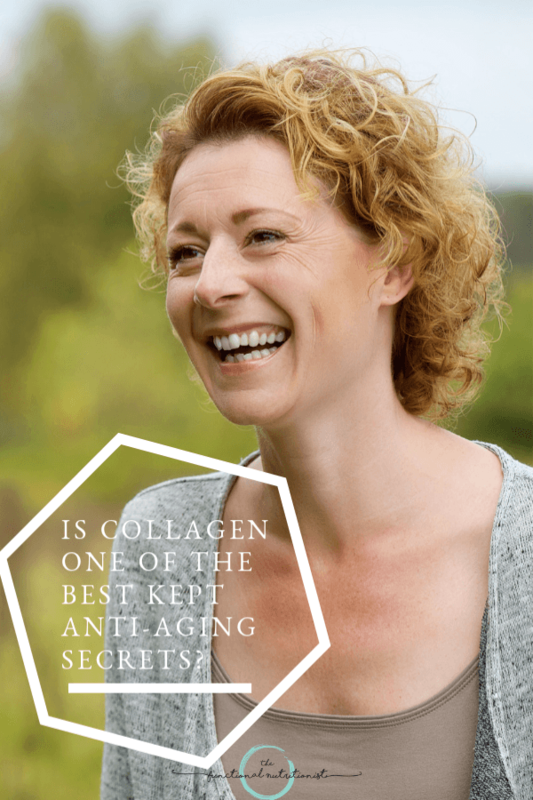 Before learning about all the anti-aging benefits of a collagen supplement, you should understand what exactly collagen is and its purpose in the body. Collagen is an insoluble fibrous protein that helps give structure to hair, nails, skin, bones, tendons, and ligaments and is often known as a beauty and anti-aging supplement. This is why it is one of my top recommendations for my clients that are over 40. As we age, collagen production is diminished and a collagen supplement, as well as a balanced whole foods diet, can help replace what has been lost due to the natural aging process. In ancient Greek, the word for collagen actually translates to the word “glue” which is exactly how it works. It holds our body together providing strength like a glue but also allowing tissues to withstand stretching. Collagen is made up of the amino acids glycine, proline, hydroxyproline, and arginine. These amino acids create important building blocks to help keep us looking and feeling young. Collagen is the most abundant protein in the body, making up 30% of the total protein, as well as 70% of the protein found in skin! A large amount of collagen is also found in connective tissues and bone. Since it is so abundant in the body, it is definitely a nutrient that you should keep an eye on if you are interested in looking and feeling younger. Type I and also type II collagen is found primarily in bones, skin, tendons, organs and blood vessels with the majority of protein found in cartilage is type II. So, if you are looking to improve skin and hair, look for types I and III. If you are looking for joint support, make sure your collagen supplement contains type II. While our ancestors may have had an abundance of collagen in their diet (think chicken or pigs feet, gelatinous meat, and bone broth) from utilizing the whole animal (bones, skin, organs, tendons) our modern-day diet is definitely lacking in collagen. While bone broth has become very popular lately, it is not a mainstay in most kitchens. I do recommend incorporating more bone broth into the diet, but I understand most people may not have the time to make bone broth from scratch. I am starting to see grass-fed bone broth at the grocery store, like the Kettle and Fire brand, but you can also buy some reputable brands online. One of my favorites is The Flavor Chef since they are organic and grass-finished. Thrive Market also has their own grass-fed and pasture raised bone broth in beef, chicken and turkey flavors. To combat free radical damage, it’s important to have ample antioxidants in your diet which can neutralize free radicals by donating one of their electrons. Some important dietary antioxidants are vitamin C, beta-carotene, and vitamin E. These can come from a whole foods diet which consists of ample fruits, vegetables, nuts and seeds. Another potent antioxidant is astaxanthin, which is a reddish orange carotenoid pigment that naturally occurs in krill, algae, red trout, shrimp, lobster and salmon. This “king of antioxidants” is known to cross the blood brain barrier and the blood retinal barrier in the eye, and is both water and fat soluble. It’s known to support healthy vision, brain and heart health, and possibly increase male fertility. Its antioxidant capability is 600 times higher than vitamin C, 550 times higher than vitamin E and 40 times higher than beta-carotene. Astaxanthin has another unique benefit of providing internal sun protection. Since it’s stored in the skin it provides protection against damage caused by the environment or the sun. I recommend having at least two servings of astaxanthin rich foods such as wild-caught sockeye salmon per week. I highly recommend Vital Choice for sustainably sourced seafood. This is the freshest salmon I’ve ever tried. If you prefer an Astaxanthin supplement, the recommended dose is generally 4-8 mg. one to three times per day. Collagen has numerous health benefits, such as anti-aging, wrinkle prevention, healthy hair and nails, cellulite reduction, bone density, and healthy joints, with anti-aging benefits and joint health are at the top of the list. 70% of the protein in skin is collagen. The aging of skin appears in the form of wrinkles and lines in the skin as well as skin pigmentation changes which are all a result of the breakdown of collagen. While this is natural with aging, it can also be accelerated with too much sun exposure and certain diseases. Research supports the anti-aging skin benefits of collagen. After just 4 weeks of collagen supplementation, a double-blind placebo-controlled study showed a statistically significant higher skin elasticity level in elderly women. Another study of 114 women aged 45-65 years of age showed a statistically significant reduction in eye wrinkle volume and a long-lasting effect was noted after 4 weeks of stopping supplementation. Each bulb of hair is wrapped in a sheath of collagen along with tiny micro vessels that deliver nutrients to the hair. For hair to be healthy and shiny, nutrients need to be able to get to the hair, and proper collagen formation helps support this task. A study published in the Journal of Investigative Dermatology found that collagen may even help reverse signs of hair loss. Look for collage types I and III for hair benefits. Collagen type VI is strongly expressed in the hair follicle and this type of collagen could be a potential therapeutic target for hair loss. In a study published in the Journal of Cosmetic Dermatology, daily ingestion of bioactive collagen peptides has shown to increase nail growth by 12%, to improve brittle nails, and to reduce the frequency of broken nails by 42%. Save yourself a trip to the nail salon and try supplementing with collagen daily for 4 weeks to start seeing the benefits of collagen. Look for collage types I and III to improve nail health. Who doesn’t like strong beautiful natural nails? Cellulite is seen in skin that has that orange peel or cottage cheese like appearance, and it affects 85% of women over the age of 20! Cellulite can be found on the thighs, buttocks, and abdomen and can be exacerbated by being overweight. It is commonly accepted that connective tissue has been weakened by an altered subcutaneous extracellular matrix causing the appearance of cellulite. Research published in the Journal of Medicinal Food showed that regular ingestion of collagen over a time period of six months, led to improvements in skin appearance in women suffering from moderate cellulite. This improvement was the result of stimulating dermal metabolism by increasing type I and type IV collagen expression. Look for these types of collagen for cellulite improvement. 90% of the organic (non-mineral) material in bone is collagen, so it’s not surprising that collagen is an important nutrient in bone density. In a randomized, double blind, placebo-controlled study of post-menopausal women with age related decline in bone mass density supplementing with 5 grams of collagen peptides per day for 12 months showed a significant increase in the bone mineral density of the lumbar spine and the femoral neck (thigh bone neck), which is prone to fracture in the elderly. Studies also show that collagen found in osteoclasts, which are our bone building cells, stimulates cell differentiation which causes new bone production! Look for type I and type III collagen for bone health. Ligaments, joints and tendons are comprised of an intricate matrix that predominately consists of collagen. As you age and collagen decreases, the risk for degenerative conditions like osteoarthritis increases. In a study of 73 athletes consuming 10 grams of collagen per day for 24 weeks experienced a significant reduction in joint pain while at rest and while walking compared to the control group. Studies suggest taking an undenatured type II collagen supplement with a starting dosage of 40 mg. once per day. If using a type II hydrolyzed collagen, the suggested dose is 8-12 g per day, which at this dose can have potential pain-relieving and anti-inflammatory effects. Type II collagen is beneficial for osteoarthritis, rheumatoid arthritis and general joint pain and stiffness. Glycine, an amino acid which is part of collagen, helps the digestive system with the production of bile in the gallbladder and is beneficial for gastrointestinal disorders like IBS. It also helps heal and seal the gut lining which prevents leaky gut and all the adverse health consequences that come with it like auto-immune disease, food sensitivities, and thyroid problems. The gut wall contains microscopic folds or “villi” which are built of collagen, so supplementing will help restore the normal mucosal layer and strengthen the gut wall. Since 60-80% of the immune system is located in the gut, it’s critical to keep the gut healthy and strong. If the collagen supplement is not organic (for chicken), wild-caught (marine source) or grass-fed (for beef), chances are the collagen will be sourced from a CAFO (concentrated animal feeding operation) and will have contaminants such as heavy metals, pesticides, and herbicides. If you are using a marine collagen, make sure the fish is sustainably sourced and wild-caught or it may have increased heavy metal contamination as well as other environmental contaminants. A hydrolyzed collagen supplement is the most bio-available form of collagen since it is broken down into smaller pieces while soaked in an enzymatic bathe, making it easier for the body to digest and absorb. Hydrolyzed collagen is also referred to as collagen hydrolysate or collagen peptides. This type of collagen is still effective when taken with food. Undenatured collagen is not processed by high heat or chemicals. A novel glycosylated undenatured collagen type II is called UC-II and this is derived from the chicken sternum. This was created to preserve the biological activity of collagen and studies show it is effective for joint pain relief, mobility and flexibility. This type of collagen should be taken on an empty stomach. Studies show 2-10 grams of hydrolyzed collagen per day is effective, so a good dose to start with is 2 or 3 grams and you can work your way up to more if needed. The recommended dose of type II undenatured collagen is 40 mg. per day on an empty stomach. You can add collagen powder to coffee, tea, juices, water, smoothies, and recipes. You won’t even notice it since it does not add an additional taste to your drinks or food. Ideally, take all collagen supplements on an empty stomach for the best absorption, but hydrolyzed can be taken with food as well. Vitamin C is required for the formation of collagen. Vitamin C is found in citrus fruits, kiwi, strawberries, red peppers, broccoli and other fruits and vegetables. Make sure to get an ample amount of vitamin C in your diet so that you are not hindering the natural production of collagen. If you know your diet does not contain an adequate amount of vitamin C (the RDA ranges from 65 mg to 120 mg for adults), then I recommend a vitamin C supplement in the form of Buffered Vitamin C or Liposomal Vitamin C. Minerals like manganese (whole grains, nuts, seeds, beans, cabbage) and copper (oyster, shellfish, whole grains, nuts, beans, potatoes) are also important as well as foods abundant in the flavonoid anthocyanidin (blackberries, blueberries, cherries). Since collagen is made of amino acids, adequate protein consumption is necessary for collagen formation. This protein can come from eggs, beef, fish, and poultry. Since we no longer eat our protein “nose to tail”, meaning the meat plus the organs, connective tissue and cartilage, I do recommend incorporating more bone broth in the diet or taking a high-quality multi collagen supplement. For bone broth, I highly recommend the Brothery by the Flavor Chef since they offer certified organic and grass-fed broths. Sauce pot, box grater, sharp knife, peeler, cutting board, serving bowl. the Baker & Olive Thai Mint Lemongrass Balsamic Vinegar. Great Lakes Collagen is collagen type I, which according to this family-run company it is just as beneficial as using type I and III combined and is also beneficial to joints. They believe that all collagen breaks down into collagen peptides or polypeptides which are then used as needed in different tissues in the body. Z!nt Grass-fed Beef Collagen contains type I and type III collagen and is made from pure, premium unflavored hydrosylated collagen powder from non-GMO, grass-fed, pasture raised cattle and contains no preservatives. They offer a 90-day money back guarantee if you are not satisfied. Vital Proteins collagen powder is sourced from grass-fed, pasture-raised bovine hides from Brazil. Their Marine Collagen is sourced from wild-caught, non-GMO Red Snapper off the coast of Hawaii. Their products are mainly made from type I but also contain type III collagen, but these will provide benefits to hair, skin, nails, bones, joins, cartilage, and ligaments. They do have a specific cartilage collagen type II supplement in pill form as well. They offer a collagen creamer product in vanilla, coconut, mocha and gingerbread as well as a beauty line in lavender lemon, strawberry lemon, melon mint, and tropical hibiscus. LevelUp Multi-collagen provides 5 types of collagen (I, II, III, V, and IX) from grass-fed bovine, wild-caught fish, free-range chicken, and eggshell membrane. It also contains an Infinite Youth Matrix which is a powerful blend of glucosamine, hyaluronic acid, biotin and MSM for skin, hair, nail and joint support. Who should take this? Those wanting skin, hair, nail, digestive and joint health benefits. Protocol for Life Joint-UC contains undenatured collagen type II along with seaweed derived minerals. Joint-UC has been clinically validated for its ability to help maintain healthy joints through the support of a balanced immune system response to everyday wear and tear. This product supports joint health, mobility and flexibility. The recommended dose is one capsule on an empty stomach. There are several ways to increase collagen production if you are following a plant-based diet. First, make sure you are getting the proper co-factors for collagen production as mentioned previously (vitamin C and protein). Certain herbs are also very beneficial for collagen production. These are horsetail, stinging nettle, comfrey and He Shou Wu (Fo-Ti). One of my favorite products, Anima Mundi Plant Based Collagen, contains a mixture of several of these herbs and is completely plant based. This plant-based collagen supplement can be found at Amazon or at the Thrive Market here. The Thrive Market is an online retailer that provides wholesale prices through a membership community. Another plant-based collagen support product is Garden of Life mykind Organic Plant Collagen Builder which contains vitamins, minerals, a food blend, bioflavonoids, bamboo extract and many other nutrients that supports collagen production. Type I collagen will still provide overall benefits for hair, skin, nails, digestive and joint health since all collagen is broken down into peptides. As a functional nutritionist, I’m a huge proponent of promoting beauty from within by eating a predominately plant-based diet and supporting the body with the nutrition it needs to do its job. A whole food-based diet is always the foundation of supporting health and wellness, with supplements playing a supportive role. Adding collagen to your diet can provide significant anti-aging benefits, especially for women over forty years old. However, a supplement is not going to fix or compensate for a poor diet, so I always suggest start with dietary changes first. If you would like personalized dietary and supplement recommendations tailored to your specific health status, you can sign up for a nutrition consultation here. König D, Oesser S, Scharla S, Zdzieblik D, Gollhofer A. Specific Collagen Peptides Improve Bone Mineral Density and Bone Markers in Postmenopausal Women—A Randomized Controlled Study. Nutrients. 2018;10(1):97. doi:10.3390/nu10010097. The above statements have not been evaluated by the Food and Drug Administration. The products mentioned are not intended to diagnose, treat, cure or prevent any disease. Check with your doctor or nutritionist before starting a new supplement program.